The new Panasonic Toughbook is touted as the world's first with an aspect ratio of 3:2 and is a fully rugged, two-in-1 detachable laptop. 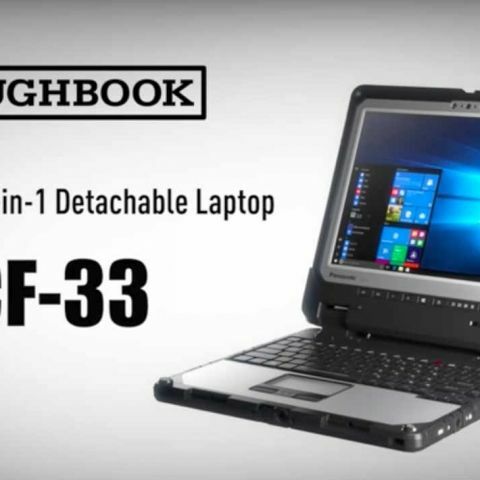 Japanese tech firm Panasonic on Friday introduced the Toughbook CF-33, a detachable rugged laptop at Rs 2.7 lakh in India. It is touted as the world's first with an aspect ratio of 3:2 and is a fully rugged, two-in-1 detachable laptop. "Panasonic Toughpads enjoy 65 per cent market share in India and with the introduction of new products in 'Toughbook' and 'Toughpad' series, we aim to increase our market share to over 70 per cent," said Gunjan Sachdev, Business Head, Toughbook and Toughpad Division, in a statement. Panasonic CF-33 runs 64-bit Windows 10 Pro operating system (OS) with 2.6GHz Intel Core i5-7300U vPro processor coupled with 8GB RAM and 256GB SSD. Toughbook CF-33 also sports 2MP webcam with stereo microphones and an 8MP rear camera. Connectivity options include USB 3.0, HDMI, LAN, micro SD-XC and headset ports. Additional tablet configuration options include second USB 2.0 port, serial and barcode reader, smartcard reader, contactless smart card reader and fingerprint reader. Which is the best 2 in 1 laptop under Rs 25K? Please suggest a gaming laptop , My budget is Rs 1 Lakh ?